Bill K. Kapri, better known by his stage name Kodak Black, is an American rapper. Black is noted for his singles ‘Zeze’, ‘Roll in Peace’, ‘Tunnel Vision’, and ‘No Flockin’, as well as his numerous legal issues. As of 2019, Kodak Black’s net worth is estimated to be $600 thousand dollars. Bill K. Kapri “Kodak Black” was born on the 11th of June, 1997, in Pompano Beach, Florida. His father left the family soon after Kodak was born, and he was raised by a single mother. Kodak and his mother shifted to a nearby housing society in Golden Acres where many immigrants from Haiti also lived. Kodak began selling drugs and indulging in other petty crimes at an early age. He was not interested in school and had a poor attendance record. He got into several fights in school, which led to his expulsion from the school on many occasions. Kodak Black began his career when he was 12 years old, and he joined a local small-time rap group named ‘Brutal Youngnz’. He, later on, switched to another group called ‘The Kolyons’. In 2013, Kodak released his debut mixtape, ‘Project Baby’ which did well at the local nightclubs and brought Kodak significant fame. The following two years, he released two more mixtapes, ‘Heart of the Projects’ and ‘Institution’. In 2015, famous rapper Drake danced to one of Kodak’s songs, ‘Skrt’, and this was one of Kodak’s major career-defining moments. A number of ‘google’ searches for his song soared and he was exposed to national fame. Kodak fast-growing popularity came through when he released his fourth mixtape, ‘Lil B.I.G. Pac’. The mixtape was released by Atlantic records and it became his first album to feature on the Billboard music charts. In 2017, Kodak released a single ‘Tunnel Vision’ which reached the top of many American music charts. The single debuted at the 27th spot and peaked at number six on the ‘Billboard Hot 100’. In August, he dropped ‘Project Baby’ the sequel to his mixtape ‘Project Baby’. On of the singles from the album, ‘Codeine Dreaming’, became hugely successful and peaked at the 52n spot on the Billboard Hot 100 chart. On Valentine’s Day 2018, Kodak released another mixtape, ‘Heartbreak Kodak,’ which was yet another success. As of 2019, Kodak Black’s net worth is $600 thousand dollars. You gotta go against all odds, you know? Boss your life up. Kodak Black is a controversial rapper who is best known for his singles ‘Roll in Peace’, ‘Tunnel Vision’, and ‘No Flockin’. Black is really young but is already very successful. His debut album ‘Painting Pictures’ reached the third spot on the Billboard 200 chart. As of 2019, Kodak Black’s net worth is approximately $600 thousand dollars. 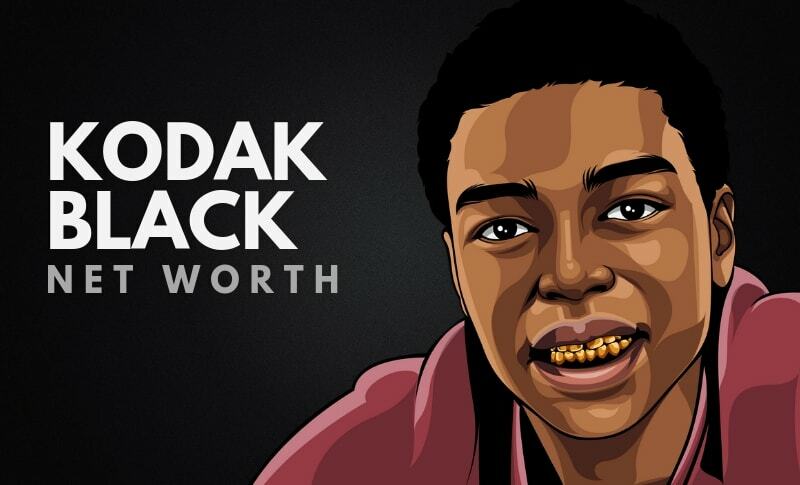 What do you think about Kodak Black’s net worth? Leave a comment below.